This is an aerial view of the math centre. There are counters to put in the muffin tray -- one counter in #1, two counters in #2, etc. The counters are animals and can be sorted by colour or by species (kinds) -- there are cats, bears, turtles, etc. We also have coloured popsicle sticks. Two students made a design around the edge of the table. Next, I asked them to make a pattern with the sticks. Materials in the math centre change often. 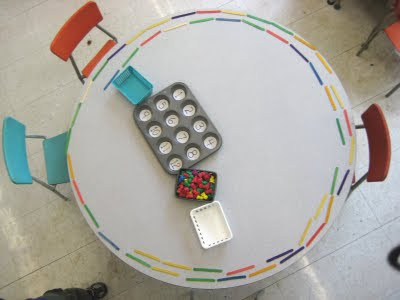 We have many math activities that focus on number recognition, number relationships, counting strategies, quantity relationships, one to one correspondence, comparing and ordering, measuring, graphing, patterns, shapes, and sorting. This is the block centre. The blocks have taken quite a beating in the last few weeks! We start the year with the lighter blocks and then move to different kinds of wooden blocks. 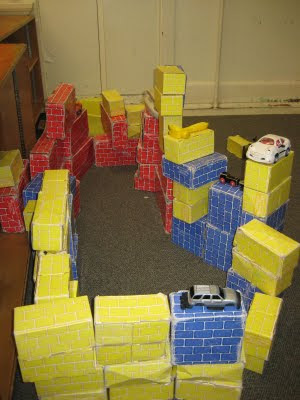 Two students built this "house". The living room is the red room at the back. I'm so excited about your classroom blog! My son's in your afternoon class. I love that the kids will be learning a new poem every week! Looking forward to your postings!